The market is a wild creature that no trader can control. For the intraday trader, the market is even more uncontrollable. Trying to control the market is impossible. In this wilderness where we face overwhelming market forces, how can a trader achieve consistent performance? The trick lies with controlling the only thing a trader can control. And that is the trader himself or herself. If we cannot control the market, the best option we have is to control our response to the market. To do so, we need to define our own playing field. Instead of allowing the market to overrun us, we demand what we want to see from the market before taking any action. If the market fails to show us what we want to see, we will not enter the game. Make the market prove itself to you, and not the other way round. The first and essential step to defining our playing field is to create a trading plan. A trading plan is specific to your trading style and strategy. In this article, we will show how to create a price action day trading plan. In theory, the perfect trading plan anticipates every situation and prescribes what to do. The perfect price action day trading plan has the response to every intraday market behaviour. But we know that it is not workable to anticipate every possible situation down to the finest detail. This is because market price action has infinite possibilities. Thus, the practical approach is to build a set of trading rules and guidelines. Instead of anticipating every scenario, we should rely on trading rules and guidelines. Trading rules are rigid. They cannot be broken under any circumstances. Trading rules guarantee a consistent playing field for the price action intraday trader. Trading rules typically define the markets, time-frames, and price patterns you can trade. If you follow these rules, your trades are consistent and the Day Trading Evaluation Cycle is meaningful. Trading guidelines are flexible. You can break them for the right reasons. Trading guidelines empower the price action day trader to deal with an ever-changing market. A trading guideline might state that we need a bullish bar as a long setup bar and a bearish bar as a short setup bar. 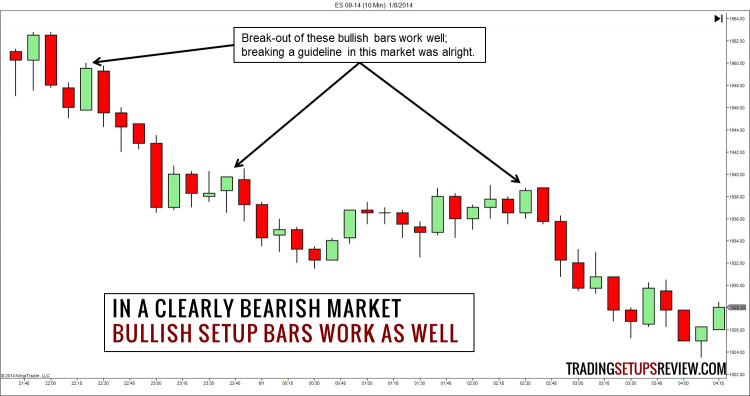 But when the market bias is clearly bearish, we can choose to take bullish bars as our setup bars. Having both trading rules and guidelines is the key to building a sensible trading plan. Instead of having fixed rules in a market of flux, we have guidelines, which are “rules on breaking rules”. As most price action day traders are discretionary traders, this distinction is extremely helpful. Many traders break their trading rules under the guise of “exercising discretion”, leading to inconsistent trading. With defined trading rules and guidelines, they can no longer break their trading rules. They can only exercise their discretion with regards to trading guidelines. Trading rules cannot be bent. A vital trading rule pertains to your trading size which is the product of a position sizing system. A position sizing system tells you how much to trade with your trading capital and given your trading performance. Your position size is arguably the most important part of a price action day trading plan. Regardless of your trading edge, if you trade a position size that is too large, you will go bust. If you trade a position size that is too small, you are not maximizing your profit potential. A comprehensive day trading plan does not only help us find profitable risks in the market. It also includes actions to mitigate risks beyond the market. There are many risks in our intraday trading process that lies beyond the market price action. These are risks related to factors that do not add to our trading edge, but can definitely damage our trading edge if left unmanaged. To build a solid price action day trading plan, bear these principles in mind. Know why something is in your trading plan. What does it add to your trading process? Many traders start with a trading plan template from other traders. While there is nothing wrong with that, you need to understand the trading plan. This is because a trading plan is not static. It changes according to your progress as a trader. To know how and when to change it, you must understand the underlying reasons for every part of your trading plan. Focus on creating an actionable plan. An effective trading plan must lead to actions. When you write your trading plan, use verbs. Be clear. A well-written trading plan that focuses on specific actions is far more likely to lead to compliance. Price action trading demands years of learning, observation, and practice. Learn from various sources and be open-minded. Eventually, you will find a trading perspective that you understand and can identify with. Regardless of your eventual perspective, you will need a trading plan. Remember that a price action day trading plan is an individual masterpiece. You craft it with your understanding of the market price action and your trading experience. You are the only one that can realise its benefits. A trading plan is not about the market. It is about you. Want learn how to create a price action day trading plan? 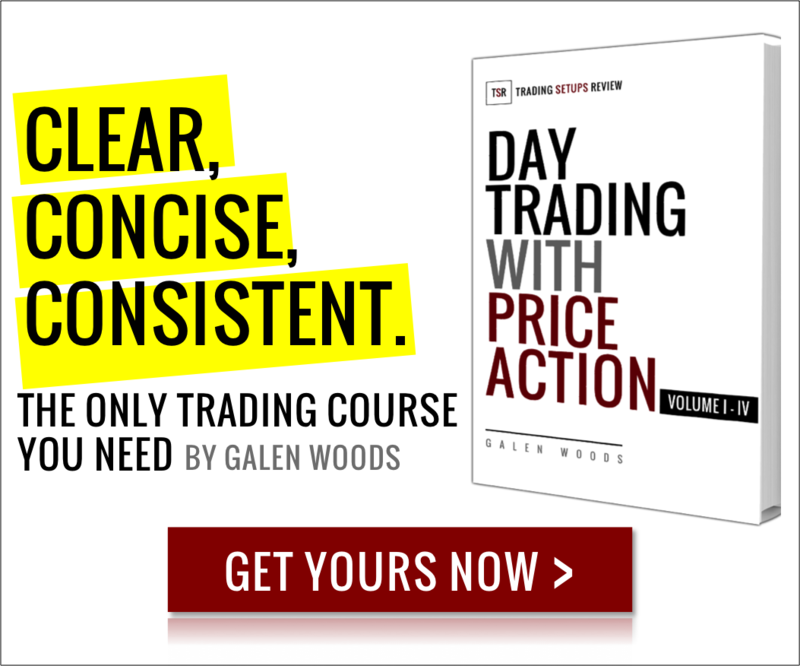 – all you need for a price action day trading plan.